Spanish instruction in the early grades builds a foundation of vocabulary and language. Students in first through fifth grades receive instruction in Spanish once a week and practice Spanish using a variety of songs, games, and speaking activities. 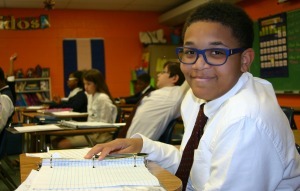 Students in Middle School receive more formal Spanish instruction with emphasis on conversation, reading and grammar. Instruction includes homework, tests, quizzes and projects. Students may complete eighth grade with a high school credit for Spanish I, and most eighth graders get the chance to apply their Spanish language skills when they participate in the Joshua Expedition mission trip to Costa Rica.